Few classes are as well-attended or as dreary as exam reviews. In order to liven things up, divide your review questions (multiple-choice format) into categories and assemble the students into teams. Give the student teams names and allow them to study together before the review. During the game, the instructor spins the wheel with the categories written on it and reads a question from that category, and within 60 seconds, all of the students must give an answer, using classroom communication systems, many of which can be programmed for teams. The score for each team is the proportion of correct answers. The game can be as long or as short as desired and can be preceded, interspersed with or followed by questions from students. Geology Jeopardy is probably a more appropriate format for topic distribution, and less work than wheel-building, but seems less dramatic. 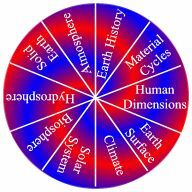 Has students tackle questions on a broad variety of geoscience topics. Encourages students to study together. Enables students to assess their readiness to take a geology exam. Makes a dull task fun and competitive for the students. This interactive game is intended to liven up an exam review session in a classroom equipped with a course performance system. Really daring instructors could incorporate it into the exam (but allow students to opt out and do an ordinary pencil and paper alternative if they want to). This is really a trivia game. The only connection between this game and the "Wheel of Fortune" is the major prop and, hopefully, the melodrama. The biggest challenge is building the wheel. It should be big, with names of topics visible from the back of the room. I'm still looking for a wheel-of-fortune applet which could create a virtual wheel to use in a web browser and be projected. The image on the left shows an example. Put together a list of multiple-choice questions, which may include actual exam questions, assigning each to one or more topics. Put them in some context (database, box of index cards, printed list) in such a way that it will be easy to look them up quickly be topic. Assign the students to groups early to give them plenty of time to study together. Have each team pick a name or pick one for them (the Fighting Turbidites, the Mighty Feldspars, the Amazing Trilobites, what have you). For a large class, the easiest way to run this activity is with an electronic course communication system. Many of these can be set up for teams. Otherwise, feed individual scores into a spreadsheet, where they can be totalled and tracked by team. Have the students/contestants take their seats and get out their handhelds. A good warm-up would be to ask for student questions and handle these before launching into the game. The instructor spins the wheel, asks questions, and keeps score. The contestants should answer the question within a given time limit. Allowing discussion would probably be a bad idea. After it runs out, show the number of correct answers, show or announce team scores, and tell the students the best answer. Have one of them tell you why it is the best answer. Then, spin the wheel again and on to the next question. A more apporpriate game-format and an easier one to implement might be a team version of "Jeopardy", which would allow the instructor to decide how many questions to include per topic, but having students pick the topics won't even things out if time runs out before questions do. One of the CPS manufacturers, eInstruction, even has a Jeopardy game packaged with their software. In any case, make sure to include as much of the game's fanfare as possible, including the terrible "Waiting for contestants" music. There are no grades here, but one team will win. Prizes are useful only insofar as they keep the mood light. It could be something as simple as certificates for the winning team, or rocks, or cookies. Or all participants could be awarded prizes (rocks, cookies, both?) and the winners additionally recieve certificates, ribbons, posters, or whatever. For more information about using handheld electronic response devices, see Classroom Communication Systems.